Brooke Henderson shot a bogey-free 5-under 66 on Friday to move into a tie for the lead after two rounds at the Marathon Classic. 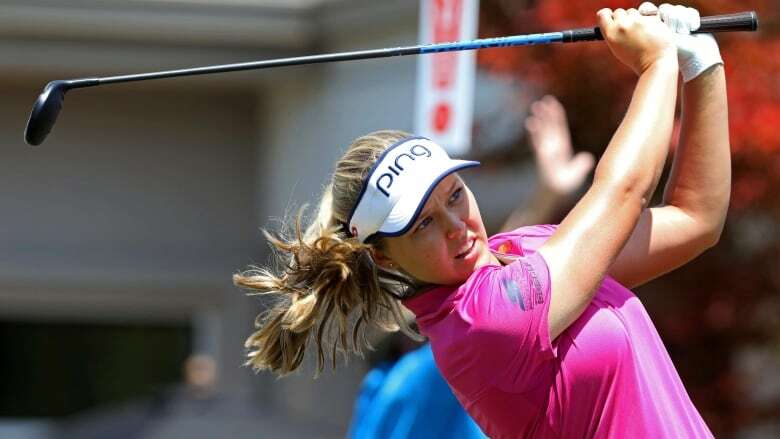 Canadian Brooke Henderson has struggled in her past two appearances at the Marathon Classic. The 20-year old from Smiths Falls, Ont., finds herself tied for the lead after two rounds of the tournament following a bogey-free 5-under par 66 on Friday to move into a tie with Caroline Hedwall. Both are at 9-under 133 through 36 holes. "It's just fun to be in contention again and to see your name at the top of the leaderboard, it's exciting, and hopefully good things will happen," Henderson said. "To finish birdie-birdie was really important, and it's fun to see your name at the top," Henderson said. "I'm excited to be in the final group." "I've been in this situation, and I mean, it was a long time ago, though," said Hedwall, who shot a 4-under 67 on Friday. "I'm just looking forward to the weekend. This is obviously what you practice and work hard for, to be in contention." Brittany Marchand of Orangeville, Ont., is 4-under after a second-round 68 while Hamilton's Alena Sharp is even. Maude-Aimee Leblanc of Sherbrooke, Que., missed the cut at 1-over. Sei Young Kim, who shot an LPGA Tour-record 31-under to win last week's event in Wisconsin, was eight shots back after a 1-over 72 on Friday.